NEWTON, MA--(Marketwired - Feb 28, 2017) - BRIDGE Energy Group, the leading consulting and systems integration company focused on improving utility operational performance, announced today that Hugo van Nispen has been appointed Chief Executive Officer. 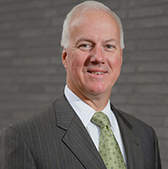 Mr. van Nispen has more than 25 successful years of utility and energy industry experience, most recently as President and CEO of KEMA, Inc., which he grew to be a recognized leader in energy consulting, testing and sustainability, and which has now merged with DNV GL, a global leader in risk management services. His background includes extensive work in grid modernization, systems implementation, strategy formulation and business process optimization. "I am looking forward to leading BRIDGE at a time when the utility industry is undergoing such transformational change meeting increasingly challenging customer, regulatory and shareholder expectations," said Mr. van Nispen. "The work the BRIDGE team does enabling clients to rapidly realize breakthrough results through grid modernization, operational effectiveness, cyber-security, and analytics, aligns perfectly with the critical solutions that utilities need to navigate through the business, technical and regulatory challenges of today and tomorrow." The electric grid operations and business model are in a state of significant transition. As a result, utility organizations are faced with increasing pressure from changing social, business and technological dynamics. In addition, tightening security, analytical measurement and increasing operational efficiencies require utilities to integrate agile consulting resources that are familiar with core systems and advanced technologies as well as the operational impacts to the business processes associated with their deployment. Hugo van Nispen is well versed in these new disciplines and poised to take BRIDGE to the next level. "Hugo's name is well known in the utility industry as a dynamic leader who has built successful businesses," said Colum Lundt, BRIDGE co-founder and Board member. "This industry is experiencing tremendous change, and it's the right time to bring in a leader with Hugo's track record to build upon the team's successes and take the company to the next level." BRIDGE has experienced tremendous growth over the past few years, having been named to Inc. 5000s Fastest Growing Companies 6 of the past 7 years while expanding its client base to nearly half of all the large North American utilities including industry leaders such as National Grid, Pacific Gas & Electric, Arizona Public Service, Exelon, and others. "Hugo will build on the strong foundation put in place by Dave Olsson and the senior team at BRIDGE," said Barry Goldsmith, Board member and General Partner at Updata Partners. "We wish Dave much success in his future endeavors and appreciate his enormous contributions to the Company." Hugo van Nispen, the newly appointed Chief Executive Officer at BRIDGE Energy Group.